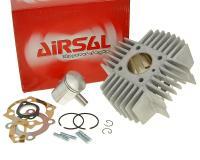 Airsal 48.8cc sports aluminium cylinder kit is a top-quality, low-cost alternative for Puch Maxi scooters. Includes all parts for installation: gasket set, piston, piston rings etc. Cast aluminium for improved heat dissipation with a hard chromed bore for wear resistance. Smooth torque and great performance make this cylinder great value for money. “49” sports cylinder is somewhat better than the original cylinder, and offers a slight performance increase. Cylinder head not included; the original head may be retained.